Are you interested in knowing more about Trauma and how Yoga can help? Teaching Trauma Sensitive Yoga – A Practical Guide provides many of the answers you are looking for. 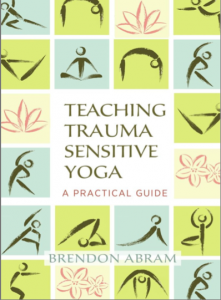 Brendon Abram combines his first-hand experience with PTSD in the field and years of teaching to offer this practical guide to bringing trauma-sensitive yoga to both clinical and studio settings. Drawing on his work with military veterans, first responders, and survivors of domestic and sexual abuse, he emphasizes the importance of respecting the uniqueness of every individual and demonstrates how to use the foundational principles of yoga to create a safe experience. Brendon explains that the basic principles of yoga bring power to the practice and that breath, mindful movement, focused awareness, and acceptance of present-moment experience form the foundation of any yoga offering. 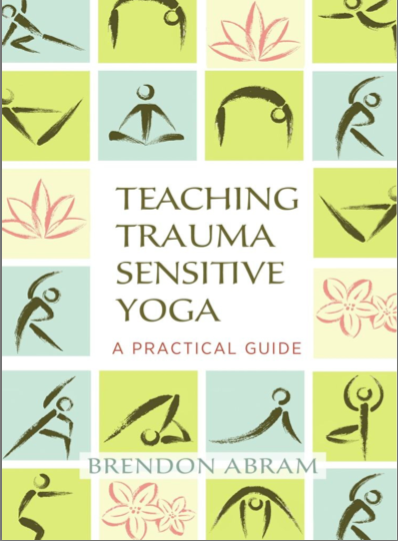 “Accessible, well guided, pragmatic, and impactful: to describe Brendon Abram’s Teaching Trauma Sensitive Yoga is to describe an ideal manifestation of its subject matter. Drawing on a deep well of experience as a trauma-sensitive yoga instructor as well as on his experiences as a veteran, Abram outlines his teaching framework with a conscientiousness that is rare in today’s yoga world. This is a welcome handbook for anyone looking to grow in their yoga teaching practice.” Read More…. Get Yoga is proud to partner with Aware Yoga to provide trauma sensitive yoga and mindfulness training. If you are a yoga teacher or clinician who is interested in learning how you can use yoga and mindfulness to help the clients you work with, you may be interested in attending one of our workshops. If you are a yoga school you may wish to incorporate a Trauma Sensitive Module into your two or three hundred hour offering. Get Yoga is a Trauma Sensitive Yoga studio. Yoga’s main purpose is to help people find peace of mind; however, most styles of mainstream yoga focus on fitness and body image and happen in less than peaceful environments. For people with a trauma or stress related condition, the thought of going to a class under these circumstances can be intimidating. All of our yoga instructors have trauma sensitive teacher training and bring this knowledge and awareness into public yoga classes. For more information on Brendon’s Trauma Sensitive Yoga class, Wednesdays at 1:30, please contact him at 613-438-9642.